Hairpins made of metal, ivory, bronze, carved wood, etc. were used in ancient Assyria and Egypt for securing decorated hairstyles. 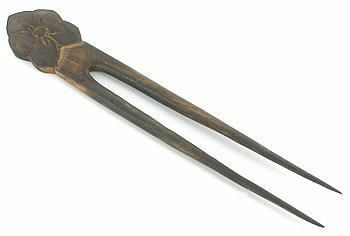 Hair Pins are much easier to use than most people think, these wood hair picks can be worn in a number of hairstyles and updos including buns, French twists, knots, chignons and many others. Use our Hair Pins, Hair Picks and Hair Sticks to hold your unique hair style. Made of wood and carved in Indonesia, these are some of the most unique pieces on the market today. Each or our Hair Picks is roughly 7" long.